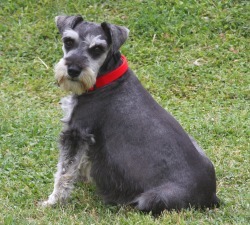 Liesel is a salt and pepper AKC Mini Schnauzer girl who weighs 11 pounds. She was born in our home, the daughter of Gracie and Troy. Liesel is a little cuddle-bug. She loves her favorite cushion on the couch and can't wait to lie on her back and get her tummy rubbed. She is pictured here just 2 days before she delivered 7 puppies! Liesel makes a wonderful mama and gives very tender care to her babies.